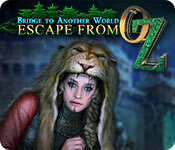 Bridge to Another World: Escape From Oz is rated 4.5 out of 5 by 36. Rated 5 out of 5 by dollyflower from Great Game! Beautiful game visually. Gameplay great, also. Rated 5 out of 5 by Bibichita from Excellent game Great graphics, sound and music. The story kept me interested. The level of challenge was just perfect for playing in a relaxed way but still not too easy and boring. A great thing is that you find what you need in the same world, not having to be jumping from one place to a very faraway world. This is the game I have most enjoyed, all the other ones were so much alike. Rated 5 out of 5 by faithaffair from One of the best games in recent times Absolutely fun, extremely pleasant to play and Toto is adorable! I'm usually more prescriptive with my reviews, but suffice to say, the Wizard of Oz theme is quite consistent here, and there is always something new to do (as opposed to going back and forth the same places to repeat the same hidden object scene, etc). Length is good too. Rated 5 out of 5 by GDeb from My Favorite Things Wonderful. Not one boring moment. A fast paced game filled with puzzles and hidden object challenges. This is a game that incorporates all my favorite game elements as well as a good storyline. The graphics are terrific. Bravo! Rated 5 out of 5 by Celestien from Really liked this one Just finished this game and I really enjoyed playing this. There were lots of new scenes to be found and explored, the storyline was well thought of, all elements coming back in one of the final HOS's, for example. The twist at the end was something I suspected already but it did not spoil my good mood with this game. Visiting all the Oz regions and meeting the well-known Oz characters was fun. The challenge was just a little better, not too difficult though, but at least not as insulting to my intelligence as some games are. The game was also long enough. Rated 5 out of 5 by ninja226 from A beautiful, imaginative and fantastic take on OZ This takes the legend of Oz and takes it to a new level that could be a legend of its own. The story is well thought out, taking its cue from the original tale of Oz, but adds its own imaginative touches that should please a more contemporary audience. Add to that fantastic, beautiful artwork, high definition images, movie style cut scenes, innovative HOS (analogous to connect the dots logical sequence of object & interaction to object), reasonable mini puzzles, and you have a fantabulous game that is long, without being boring, and a surprising twist at the end. This is a game destined to be a classic and will be as good today as it will be 5 yrs from now. Has a nice, conclusive ending without a dangler to entice you to buy the CE, which I tried, but did not seem to have enough extra content to justify the extra cost, but has some nice touches for true devotees of the Oz tale. This is a game I wholeheartedly recommend. About the only flaw I can think of is the voice overs for some of the characters were way slower than pace of a regular reader for the close captioned dialogue. Another thing I like about the game is you can play on Expert mode and still get Hint, Skip, helpful messages, and plus indicators, but no indicators on the map. I played on Expert mode and rarely had to use Hint, and puzzles were challenging enough, without being so hard that I never had to skip. Two thumbs up! Rated 5 out of 5 by woldepm1 from Cross This Bridge For a game that is not a CE it deserves a purchase. In my opinion this game is right at the top of my list. I would recommend this game for any gamer no matter what your skills in game playing. Rated 5 out of 5 by peacelilly47 from LOVE THIS GAME!! Great addition to Bridge to Another World Series. Excellent twist on the story. Lots of fun. Good length. Rated 5 out of 5 by layla19111 from Best game I have purchased from Big Fish I love games that are colorful, bright and fun. For instance, I love the Christmas Stories games. But colorful, bright and fun are hard to come by. So many of the games are dark and it's hard to tell one from another. I can say I enjoyed every moment of this game. I would love to see designers be more original and make games like this one. Lighten up, designers!! Rated 5 out of 5 by euphoria from Super Fun, Great Storyline Review based on playing the entire game. What an interesting take on the familiar Oz story. You and your little dog, Toto, are swept up in an unexpected tornado and whisked to Oz, where you'll meet unique human versions of the Tin Man, Lion and Scarecrow. The land has been overrun by "misty" predators - rats, crows and wolves - and you must use your wits (with a lil' help from Toto) to get home again. I'm not much of a dog person, but Toto was cute and helpful without being annoying and I ended up adoring him. Gameplay was varied, interesting and fun; the challenges were just hard enough that I didn't get frustrated and skip, but not so easy as to be boring. Lots of interaction in the H.O. scenes. Beautiful graphics, fun storyline; I finished in two sessions because I couldn't stay away! Recommended. Rated 5 out of 5 by BooksandGameFan from I absolutely loved this game! I almost never buy the CE of a game and I've never purchased one the first day out for full price but I was so bedazzled by this game I did both those things! This review is after playing the entire CE edition with the bonus game. I only played about 10 minutes of the demo and I knew I was going to love the game. It's like when you meet the certain perfect someone, you kinda know the minute you lay eyes on them! I was correct I absolutely Loved it! I've enjoyed the other games in this series, especially Alice in Shadowland but I liked this one even better! They really stepped things up for this game. The scenery so far is very lovely, the music is fine, you do get a pair of goggles you use to show you what happened previously in that scene, and a pair of silver slippers that help you along in the game. You also keep in contact with a man who's helping you find your way he looks a lot like the handsome actor who plays Rumpelstiltskin on Once Upon a Time. ( Robert Carlyle) I loved the quirky items, and having someone to talk to throughout the game. The game moves along nicely and it's on the easy side which I like but my favorite part is having an adorable Scottish Terrier as a helper, he looks just like my childhood dog MacTavish who I just adored! 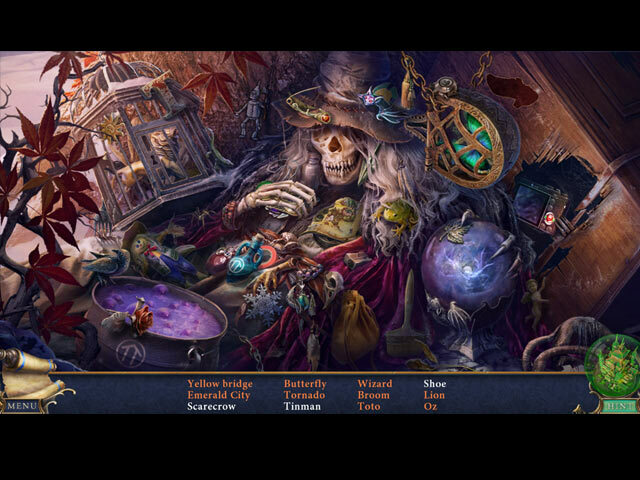 The hidden object scenes are interactive and a little different from the norm. The mini-games were fun to play and that's rare for me because I usually skip them. I only skipped one in this game and that was the maze puzzle. I think most folks who love the Wizard of Oz as I do, are really going to love this game and I highly recommend it! First game in a long time that I was really excited to play! Happy gaming, everyone! Rated 4 out of 5 by CecileE from IPHONE VERSION I haven't played any Big Fish Games for a while and decided I would give this one a go (Although I played it on my iPhone). The storyline is great. I enjoyed the company of Toto, Dorothy's dog. I loved how he participated in the journey and helped me out. The graphics are lovely, very colourful and magical. I enjoyed being able to spend my hard found coins on costumes and accessories for Toto! I am currently doing the extra chapter. The fullstory took me about 4 hours to finish. Which is really good I think even though I cannot really compare with any other game for now. The end was unexpected. I also enjoyed the difficulty of the game. I like to play to relax so it's great to be able to customize the difficulty. The mini-games and puzzles were fun! The menu is well designed too, even for a small screen (played on iPhone), not too small. Rated 4 out of 5 by coffeyfan77 from New Take On An Old Story When a tornado lands in Kansas and separates you from your children, it reads like a story you may have heard before. There can be no doubt that the developers of this game want to recall the excellent story of Oz in every respect. It says so in the title, for Pete's sake! But there is a difference between repetition and reimagination, and I'm happy to say this game does the latter and is far better for it. 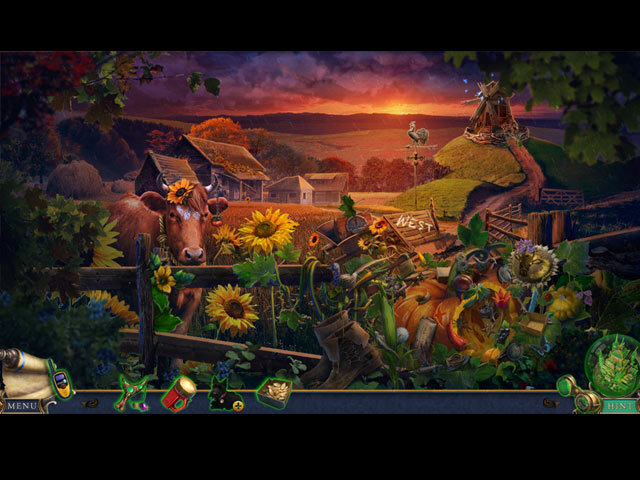 Like other games in the series, this game mixes standard hidden object scenes with adventure elements and you'll have a lot of fun exploring this new version of Oz. I have to give credit where it's due: I wouldn't have expected pagodas in the Emerald Kingdom! It's weird and it works, and I highly enjoyed the journey to get back home and the unique twists on the characters we all know and love. Except Toto, who is exactly the same and pretty adorable throughout. The other area where I felt this game excelled was the story, which has a couple of well-done twists and finishes in a way you likely weren't expecting. Graphics and sounds are good to very good, particularly in the animated sequences, and there is a good deal of interacting with objects. Overall a very solid effort. Rated 4 out of 5 by Monkfan from Different spin on Oz I enjoyed the different take on the Wizard of the Oz saga. I didn't particular care for all the mini puzzles but I liked the storyline and found the HOGs interesting. Rated 4 out of 5 by deddu from Escape From OZ Good game with fairly easy puzzles and hidden objects but with a lot of variety. Rated 4 out of 5 by Yanie1020 from Fun, but Too Easy I like games that have some difficult puzzles or that require a little more thought in figuring out what to do next. Although I found this too easy, it was still a lot of fun and very well done. I think most players will enjoy it. With a little more challenge I would have given this 5 stars. Rated 4 out of 5 by campingramps from Oz will never be the same As soon as I started playing this game I knew it was not your typical HO game. Started off very loosely following the Oz story in that there is a tornado that takes the house and lands in some weird world. Oz appears rather early in the game because you, and only you (of course), can do his bidding and off you go. Characters you meet up with are well drawn and not amateurish and their voices match their personality. There is great detail in all the scenes and especially Toto. Obviously the developer wanted a quality game and they succeeded. HO's and mini games have just the right amount of challenge to make them interesting and they are not put in the game just to constantly send you back and forth for no reason. Play the games and HO's and you progress in the story. Graphics are great and, as I said earlier, there is great detail. Colors are just the right hue for the scene and are sharp and not washed out. This is not quite a 5 star rating for me but it's close. I highly recommend this one because I know you will enjoy playing. But play the demo first and then decide. Have fun! Rated 4 out of 5 by pennmom36 from WE'RE OFF TO SEE THE WIZARD....... Today's forecast calls for sunny skies, unless you're name is Dorothy! Poor girl, she doesn't even have time to drink her morning cup of coffee, before a violent tornado rips through her house! The good news is that Toto is fine, the bad news is that the house is no longer a home, the really bad news is, I don't think Dorothy is in Kansas anymore! Yep, you guessed it, her house has a new address, in the land of Oz. (I would like to point out that in the original movie, Toto is a Cairn Terrier not a Scottish Terrier, everyone gets that fact just as wrong as the saying, Toto I don't think we're in Kansas anymore) Bridge To Another World has done it again! Dark Parables isn't the only game that knows how to put a twist on a classic fairytale! Escape from Oz however, isn't nearly as good as the last game in the series, Alice in Shadowland, because this game is too cliche, and it makes the plot seem more like a sarcastic comedy. I also found the graphics to be far more inferior from Alice in Shadowland. Instead of the wicked witches of the north, south, east and west, the land of Oz is protected by the wizards of the same origins. The problem is, that three of the wizards are missing (did anyone look under Dorothy's house?) and the last remaining wizard has agreed to send Dorothy home, but only after she finds three statues and returns them to the wizard in the Emerald city. The even bigger problem is, Dorothy isn't the only one searching for the statues. You get two helpers to assist you in your journey down the yellow planked bridge, good ole Toto, and Frank. Toto is cute, and doesn't appear to be annoying, Frank, only communicates with Dorothy via a set of video walkie talkies (bluetooth must be fantastic in the land of Oz!) In the Collector's Edition version, each scene has 2 Scotty Coins to collect. When I say collect, that's exactly what I mean, because they aren't hidden, they are quite the opposite, more like, in your face visible. You can use these collected coins to buy virtual toys for Toto, as well as hats to dress him up. This is a feature I just don't get, I just don't see the appeal of buying fake toys to give to a fake dog in a fake room, from a house that's not even habitable anymore! And the hats? Why do I want to humiliate my poor virtual Toto? Besides the Walkie-talkie Frank feature, you will also have a pair of magical Goggles that can reveal details about various events, after you play a game of Spot the Difference, of course. 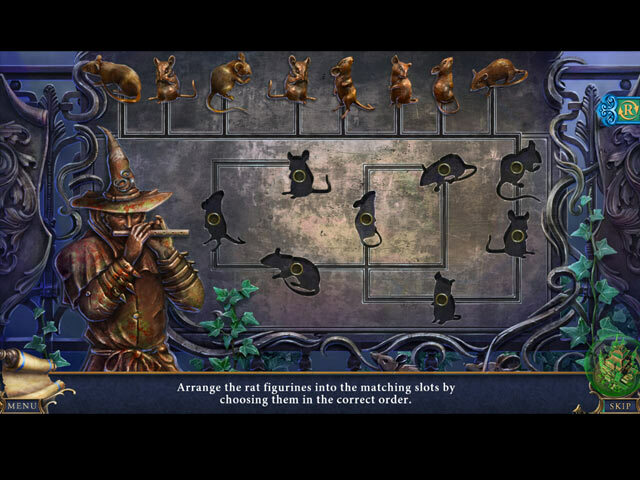 The Hidden Object Scenes are varied each time, with Interactive List finds, Multiple of the same item finds, and Placing items back into the scene. I actually enjoyed the HOP where you are tasked with finding 20 pumpkin seeds by interacting with bits and pieces of the scene. The Mini Games are pretty easy but fairly entertaining. Below are brief descriptions of some of the games you'll encounter during the demo: 1) Slide tiles to create an opening to allow a frazzled Toto to free himself. 2) Spot the 5 differences between both Goggle lenses. 3) Slide the direction stones to their correct areas based on compass points. Stones can only move to slots that are connected by lines. 4) Select various equation stones so that the shoes land on the lense. 5) Arrange the triangles to complete the image by selecting and dragging the triangles. 6) Recreate your attackers body using arrows and buttons to change the appearance and size of each portion of the image based upon the outlined clue. 7) Place the print token next to their corresponding creatures. BRIDGE TO ANOTHER WORLD GAMES AVAILABLE: *Alice in Shadowland (CE 8-4-16) *Burnt Dreams (CE 3-29-14) *Escape From Oz (CE 6-1-17) *The Others (CE 3-28-15) The Collector's Edition has 19 replayable Mini Games, 21 replayable Hidden Object Scenes, 4 Screensavers, 13 Concept Art Pictures, 9 Wallpapers, 16 Movie Videos, 6 Music Soundtracks, 20 Achievements, Collectible Scotty Coins to buy Toys and Hats for Toto, a built in Strategy Guide and a Bonus Chapter, enjoy! Rated 3 out of 5 by J9CT from Story-line got confusing!!!!! This game started out really well: grown-up Dorothy & Toto end up in Oz. They need to find their way back home and to do that they will need to assist others. Toto is a really nice touch to the game and really adorable and the two-way radio a really cool tool. However it got boring with a lot of back and forth, the story-line got quite convoluted instead of keeping it simple. I was surprised by the twist but it wasn't enough to make the game more exciting. Rated 3 out of 5 by chucklehead31 from Not much of a challenge. It's a hand-holding game that is really not for someone that wants to think about what to do. It seems like so many games are becoming like this. Rated 3 out of 5 by Caith from It's great - but so short... I really enjoyed this game. The puzzles weren't too easy but weren't too challenging, it's loosely based around the Wizard of Oz, which is a story I love, and it was generally a lot of fun. But my goodness, it was over so quickly!! I reckon it took me under four hours to complete it. I'd have liked another couple of chapters, which for me would have made this into a four/five star game. I'd still recommend it though. Rated 2 out of 5 by effcee823 from Pretty Lame Really - if you're going to use a classic tale as the basis of a game, please do it well and engagingly. Very formulaic as you make your way through all points of the compass in Oz and very easy game to play once you figure it out. There is, however, a bit of a twist at the end just to make you grimace.